While the Act of Settlement of 1701 is touted as a “resolution” of the relationship between Scotland and England that is again at issue with the Scottish independence vote, legal regulation of clothes tells a different story. The relationship between England and Scotland was long mediated through laws passed by the English to regulate appearance. 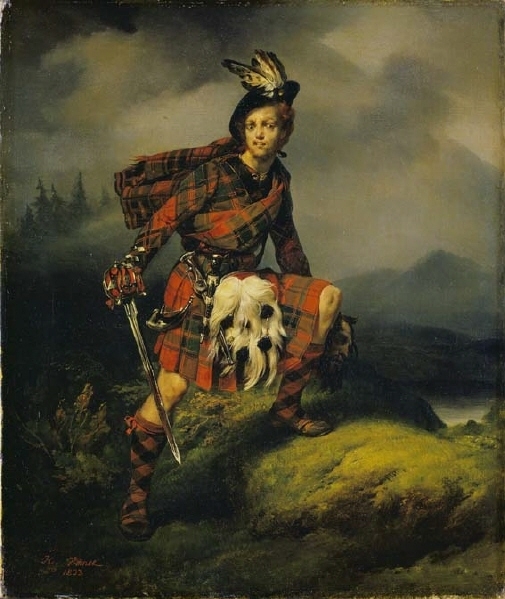 Unlike England’s regulations of the Irish – – – which focused on mustaches, hairstyles, and mantles – – – the target of the Scottish attire regulations was tartan and plaid. Even after the 1688 deposing of the controversial and Catholic King James (known as James II as King of England and Ireland, and as James VII as King of Scotland), there were continuing battles and royal contestations. no man or boy, within that part of Great Briton called Scotland, other than shall be employed as officers and soldiers in his Majesty’s forces, shall on any pretence whatsoever, wear or put on the clothes commonly called Highland Clothes (that is to say) the plaid, philibeg, or little kilt, trowse, shoulder belts, or any part whatsoever of what peculiarly belongs to the highland garb; and that no tartan, or partly-coloured plaid or stuff shall be used for great coats, or for upper coats. And so the colonies were “settled” by a plaid-wearing people. Quotes from Statute: Act of Proscription, 19 Geo. II, ch. 39 (1746) in The statutes at large, from Magna Charta, to the end of the last Parliament, 1761 in eight volumes, (Owen Ruffhead,ed.) (London : printed by Mark Baskett, and by the assigns of Robert Baskett; and by Henry Woodfall and William Strahan, 1768-70), Vol. 6: 704-710. This entry was posted in Constitutional Law, Dressing Constitutionally on September 18, 2014 by Ruthann Robson.